Please note that enrolment at Mill Strand Integrated School & Nursery is conditional on an acceptance of the Policies & Procedures of the school. Copies of policies are available from the school office and we will introduce additional downloadable versions below over the coming months. Please click on the links below to access printable versions of essential policies, school menus and the school’s dates and closures. We believe that a place in an Integrated School should be available for every child/family who want one. As the ONLY Integrated Primary & Nursery School serving the three towns of Portrush, Portstewart, Coleraine and the surrounding area, we will therefore do all that we can to meet parental demand pending increased provision by the Department of Education. To this end, the school submitted development proposals for a double nursery and double school intake for 2017 and we are delighted to confirm that we have been granted approval to double our enrolment with immediate effect, allowing us to admit up to 58 pupils into Year 1 from September 2018 onwards. Regrettably we did not receive approval for 26 additional Nursery places despite significant under provision in the Portrush area. For the past three years however, thanks to IEF and Mill Strand Trustee/Board of Directors' grants, we have been able to provide pre-school/nursery places for all applicants seeking an integrated education. 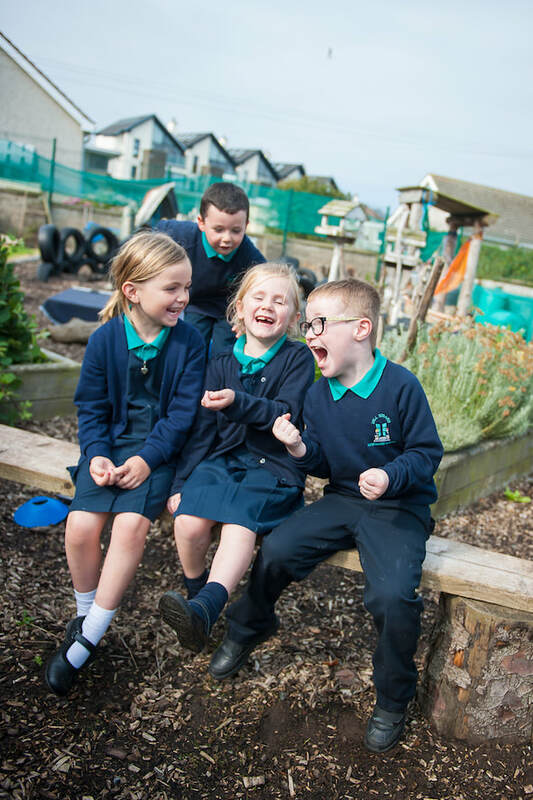 We have submitted a new Development Proposal to again seek 26 additional Nursery places for September 2019. At this point it remains the intention of the Board of Governors to offer places to all, correct age, 1st preference applicants received on or before 12 noon on Wednesday 10th January 2018. ​The doors of Mill Strand Integrated School & Nursery open to parents at 8.30am. We appreciate that many families travel a considerable distance and by opening at this time we hope to enable parents to drop off their children before travelling to work. Our Nursery and Pre School day ends at 1.00pm with parents asked to collect their children from the classroom. The school day for Year 4 - 7 pupils is 9.00am to 3.00pm daily. Parking is limited at the school and while we understand that some degree of 'double parking' will be necessary for Nursery & Pre School collection we would ask that parents park on the school side of the main road, walking up to school if possible. The Department of Education has installed a traffic flow system to allow older pupils to be collected in our 'pick up zone'. This requires parallel stopping with pupils exiting cars out of the nearside doors and walking through the bollards to the pedestrian area. Please note that to aid traffic flow and ease congestion we operate a clockwise one way system at drop off and collection times and would ask that all vehicles, even those parking along the boundary fence, use this one way system. We have outlined information on the most frequently asked questions below. Separate aspects of school requiring a more detailed response can be accessed using the "Titled Buttons' elsewhere on this page. If you cannot find the information you require, please do not hesitate to contact the school. In addition to promptly responding to your request we will review our published information and amend this page as appropriate. All visitors are required to report to the school office/reception. ​Unlike many schools we welcome parents into the school foyer at drop off and inclement collection times. From 8.30 - 9.00am this provides a point of contact with staff on duty and messages can be passed on to office staff at this time. ​With the exception of Year 1 parents, during their child's first week in school we would emphasise that, to comply with Safeguarding guidance, only staff and pupils are allowed into the school corridors and classrooms without prior appointment. Yes! This IS a Mill Strand Integrated School Meal. Thanks to J&P Catering we have been able to provide restaurant quality school meals, prepared and cooked daily from fresh ingredients since 2014. Further details will appear elsewhere on this site of our meals service. School meals cost £2.50 daily. Money should be forwarded to the school office, usually via the class teacher & your child. Menus can be downloaded by clicking on the appropriate button on the left side of this page. 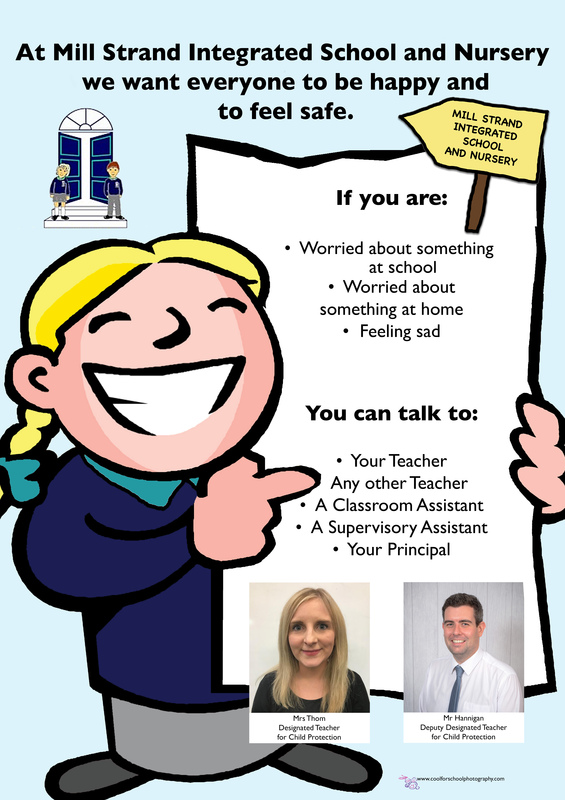 Please note that all monies sent to school should be in a sealed envelope with your child's name, the amount enclosed and the reason for payment clearly written on the outside. Pre printed money envelopes are on sale from the school office if required. The guidelines for Free School Meals have changed. Check the guidance below to see if you qualify. Do you live more than two miles from Mill Strand Integrated School & Nursery? If so please contact the school office to enquire about a travel grant. Mill Strand Integrated School has a school uniform. From September 2007 it is school policy that all pupils enrolling in Mill Strand wear school uniform. Below you will find a list of the items available from McKenzie’s, The Prom, Portstewart, S & T Moore, Railway Road, Coleraine and The Waterside Superstore, Lwr Captain Street, Coleraine. Plain navy jogging bottoms may be worn by Foundation Stage pupils Nursery/Preschool and Yrs 1&2 only. Please Note – All items of uniform MUST be marked clearly with your child’s name and class. Unfortunately the school cannot be responsible for lost items of clothing. ​It is important that your child brings a coat to school in cold weather as children play outside whenever possible. A pupil’s hair should be kept neat/tidy and a natural colour. Long hair should be tied back/prevented from hanging in pupils’ eyes. Extreme haircuts are not permitted. Nail varnish and/or make-up are not permitted for any pupil. On health and safety grounds we do not allow children to wear jewellery in our school. The exceptions to this rule are small earring studs in pierced ears and small objects of religious significance such as a cross on a chain. We ask children to either remove these objects during P.E., games and swimming or cover them with a plaster to avoid injury. Watches are permitted but should be removed for P.E. and swimming. When swimming, swimming costumes/trunks must be above the knee. Long hair requires pupils to wear a swimming cap. Should your child be unable to participate in P.E. lessons for any reason please provide the class teacher with a note.